This remarkable novel from Thanhha Lai, New York Times bestselling author of the National Book Award-winning and Newbery Honor book Inside Out & Back Again, follows a young girl as she learns the true meaning of family. A California girl born and raised, Mai can't wait to spend her vacation at the beach. Instead, she has to travel to Vietnam with her grandmother, who is going back to find out what really happened to her husband during the Vietnam War. Mai's parents think this trip will be a great opportunity for their out-of-touch daughter to learn more about her culture. But to Mai, those are their roots, not her own. Vietnam is hot, smelly, and the last place she wants to be. Besides barely speaking the language, she doesn't know the geography, the local customs, or even her distant relatives. To survive her trip, Mai must find a balance between her two completely different worlds. 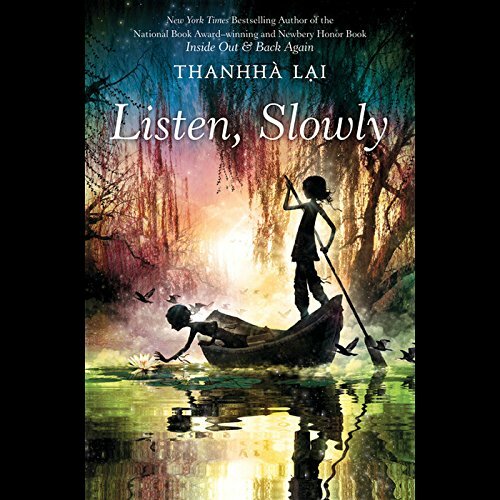 Perfect for fans of Rita Williams-Garcia and Linda Sue Park, Listen, Slowly is an irresistibly charming and emotionally poignant tale about a girl who discovers that home, culture, family, and friends can all mean different things.